Because I like playing cards, it won't come as a surprise that I also like playing card retailers. That will explain my natural interest in PlayingCardDecks.com, given that they sell decks of playing cards, with an inventory of literally thousands. The site launched in April 2017, and celebrated its first anniversary earlier this year. Now that we're nearing the end of 2018, it means that PlayingCardDecks can look back at its first full year of business, and I decided it would be a good time to interview the man who runs this show, which is Will Roya. Will lives in Las Vegas, and has a background in professional magic. Like many curious kids, he dabbled with card magic in his childhood and youth, but took this a step further by turning professional already at age 16, performing at local restaurants, ski resorts, and private parties. After college studies in theater and business, he and his wife moved from Vermont to Nevada, where he continued his magic career, performing in Las Vegas and on cruise ships. With the benefit of several years experience in the magic industry, he began getting more into product sales, and eventually gave up performing in order to devote himself exclusively to sales. He bought an office and warehouse, and after seeing how strong the market was for playing cards, made the decision to focus solely on that. 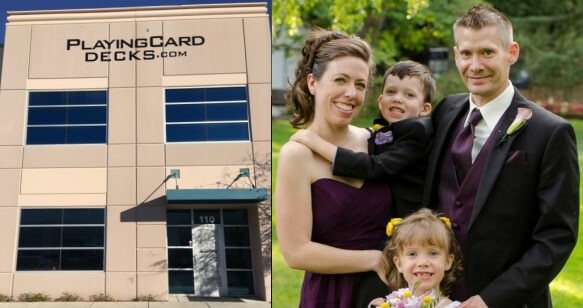 At the same time, already having built up an online business over several years via eBay and Amazon, he began creating the building blocks for his online store: PlayingCardDecks.com. Since its launch, PlayingCardDecks has been growing slowly and steadily. With the help of a small band of dedicated staff, Will is committed to making a wide range of collectable playing cards available to the public at reasonable prices, and combining this with good customer service. While a few customers do come into the physical brick-and-mortar building, the most important part of the business is the online arm. Will sees it as essential to make sure orders are quickly fulfilled and shipped, products are regularly restocked, and new items constantly and quickly added to his inventory. At any given moment PlayingCardDecks typically has 10,000s of decks in stock, with a range of at least 1500 different decks. With 1000s of orders being processed each month, literally tons of decks are being shipped out on a regular basis, with thousands of decks coming and going each week, and heading to addresses throughout the US and overseas. With such a massive range and large inventory, careful organization is absolutely necessary. But Will Roya also helps create custom decks of playing cards. With his background in magic, an interest in playing cards was a natural development. After being an active backer of many crowd-funded campaigns for playing cards, Will saw an opportunity to become involved in the custom playing card industry himself. The idea of working creatively with artists strong appealed to him, and he enjoyed the challenge of creating new decks of playing cards, as well as the opportunity to promote his business and establish his brand. He's since produced numerous decks himself, and collaborated on a number of projects run by others, being involved as an informal consultant in areas such as design, marketing, and logistics, or more directly by organizing projects, providing financial backing, or arranging fulfilment. Given his extensive experience with various aspects of the playing card industry, Will is well-placed to share some fascinating insights. I'm glad that readily agreed when I suggested the idea of doing this interview, so let's start asking some questions! For those who don't know anything about you, what can you tell us about yourself and your background in magic? I got bitten by the magic bug when I first saw a close-up magician at a local restaurant. This was in the 80's, and I was a small boy. The routines that burned into my mind were the sponge balls and the silk from egg trick - a sucker trick routine with a real egg crack finale. Later around age 10 I got a book from Grandma with basic tricks. I learned a few, but only got into it seriously in my teenage years. I got books from the library, ordered a few and got some for gifts. This was pre-internet in the early 90's. I am a slow learner, but the tricks I learned impressed friends and girls at parties, and that was enough motivation for me. By the time I could drive I was doing shows around the state of Vermont. I had an entrepreneur spirit and was highly motivated. By the time I was in college at University of Vermont I had regular gigs and was in demand for private events. When I graduated, I moved to Vegas. I learned the scene, got a gigs on cruise ships, resorts, fairs, and even some shows in Vegas which I produced myself. It was a lot of work, and as I grew older and started my family I decided to look for a better and alternative source of income. So I started doing DVDs and sales, selling magic tricks both online and in person at events. From 2009 to 2017 I really focused on sales at fairs, where I made a good living selling tricks and toys and only had to work half of the year. But as I hit 40 I decided I didn't want to travel anymore and started ramping up to launch my online business. How did you first become interested in playing cards, and how did this interest develop over time? From as early as I can remember, cards were always played in my family - after dinner, camping trips, etc. Gambling components were sometimes involved, which I really liked. The magic with cards only came later, but I always played cards with family and friends as I grew up. The GUT game was a huge game with my teenage friends, where small fortunes were made and lost. My favorite games now are Canasta and Cribbage. I did gamble quite a bit in my past, but with family and business, time has not allowed that anymore. I would like to get back more into Poker later in life. I do also play some specialty card games with the family such as Unstable Unicorns and Spy Game. And I have also "introduced" Poker to my kids - but they know never to bet real cash with Daddy about anything, ever. When did you start selling playing cards, and what got you interested in doing this full time? It was 2005 when I had a site called tricks4sale.com, with just a few decks listed. It was mostly magic based, and I ended up selling the site as my partner at the time handled all the technical side. I have been on eBay since 2001, selling personal things and other products. I decided to try cards again around 2014, and they sold well so I guess it really started from there. I expanded to Amazon and launched PlayingCardDecks in April 2017. I had staff handling business for me while I was travelling for fair sales work, until I could prove it was a viable business, and could quit the fair sales. Some people thought I was crazy as I had some very good fairs that did very well for me. But my online sales have blown away what I could make working fairs. What were some of the things you had to do prior to the launch of PlayingCardDecks in April 2017 in order to be successful? The big challenge was building the website and getting an inventory management system that could coordinate everything between eBay, Amazon and my site. It was a lot of work and I did almost everything myself, working very long hours. Luckily with current technology I could figure it out; I am not a technical person. It would not have been possible even a few years ago without expert help and a huge budget. Also building up the inventory was a huge expense and challenge, and it still is. Cash flow and product procurement is a constant challenge. Shipping logistics is a challenge as well but have that pretty locked down now, and a very good employee who helps with that. Also my wife handles all of my accounting with the part-time help of a CPA so that is very helpful. I'm not a really a numbers guy, but I am very methodical and organized. How does PlayingCardDecks today compare with what it was like when it launched? Sales were very slow to start with PlayingCardDecks, since we were brand new, but we had our eBay and Amazon sales. Now PlayingCardDecks accounts for the majority of our sales. On our first Black Friday we had a huge day and I knew it could a big success. My focus has always been on the products, and taking care of my customers, and it has paid off. What are some important things you have learned along the way? Get new items listed as soon as possible. A lot of collectors like to have it first, so I like to get it to them. Also: finding them decks that are hard to find. I might not be able to get everything, but as long as I can be my customers' #1 card supplier, I'm happy. Many customers will ask if I will be able to get something, and I'm honest with them: if I can't get it, I tell them, and if I don't have something, I will help them find it. To give us some idea of the size of your operation today, what can you share about your inventory and turnover, in terms of deck numbers? We have around 1,500 different decks. It has been pretty steady around that, with new decks coming in and other decks selling out. There are probably around 50,000 decks total in inventory, with 1,000s going out and coming in every week. Some days are slower, but sometimes we fill up a USPS truck with outgoing orders. The postal staff has been very good with us, as well as UPS and FEDEX. How large is the number of staff and supporters around you that help keep PlayingCardDecks running? Right now I have a dedicated shipping person and also a marketing manager. We have several freelancers as well as artists who design decks for us. How do you go about organizing your different decks, considering that you have thousands going in and out on a regular basis? All in alphabetical order around the office on shelves, and an overstock area in our warehouse section. What do you consider to be some of the biggest challenges in running an online business like yours? Right now I would say scaling. Finding new customers, and educating people about the unique decks we sell. We have a great set of regular customers and are just looking to expand that, and to promote unique playing cards in general. How would you describe your typical customer? Why do people buy playing cards from PlayingCardDecks? Most are enthusiasts, and some combination of collector, player, cardist, or magician. I try to keep in really good touch with my customers through email, newsletter, Facebook, etc. I listen to them, give them great service and products, and they come back. We have over 40 reviews on Facebook and Google, and they are all 5 stars! Our return customer rate is over 50%! There are a number of online retailers that sell custom playing cards. What makes PlayingCardDecks.com different, and helps you stand out from the crowd? I under-promise and over-deliver. HUGE selection, BEST prices, FREE shipping options, and FAST delivery for domestic orders. Customers also love our free sample cards and even sometimes a free deck on larger orders! We go through 100s of free decks a month as gifts and sample cards. What are some of the things you especially enjoy about selling playing cards? Seeing people enjoying them and sharing on social media. I'm not always able to review all the orders coming in, but I do see my regular customers ordering frequently when I add new products, which is a motivation. New decks definitely drive the business, and I love getting them and sharing. Do you also collect playing cards yourself? What is your own personal collection like? I am a minimalist. I mostly just collect memories (I journal every night), but I do collect a little bit, especially my own decks or the ones I really like. I will open new decks that come in, in order to check them out and then use as sample cards. Sometimes I will even depart with a special deck that is not listed on the site that a customer really wants. I'm just not connected to most material objects in my life. I would give the shirt off my back to a stranger if they really fancied it. That's just the way I am. I'm a business man with financial goals but most material possessions do not interest me. I more interested in experiences and independence. With that being said I consider my entire stock my "collection" and it is in constant rotation. If I decided to start collecting all the decks I stock it would seem like hoarding to me, and hurt my cash flow. You also produce custom playing cards yourself. When did you start with this, and what got you started with this aspect of the industry? It was a creative outlet for me to work with artists, as well as a new challenge. It was also a way to cross-promote my brand, and to expand my audience. How do you get connected with the artists and designers that create your decks? And how do you decide which decks to produce? I found a handful through free lance websites. Later I have found some through forums or networking. When I first started I was pretty flexible, as I was just learning the ropes, but with so much competition I have to be more discerning now. What can you share about the process in which a deck goes through from concept, all the way to completing the project and fulfilment? This is a huge subject to tackle, because there are a lot of steps involved. I plan to write a long form article about it in the future. What are some of the easiest, and what are some of the hardest parts of this process? Like most things the concept is the easiest, and the hardest is the execution. I use MPC for prototypes and USPCC for my finished decks. They are overall the best in my opinion, and I have a strong working relationship with them. What is it about producing a deck of playing cards that you wish consumers realized more? That it is almost impossible to please the majority. People have specific tastes and opinions on even the smallest details. How many decks have you produced so far, and which of these have been your most popular and successful designs? Around 12. The Strigiformes Owl deck has been the best selling one to date. The ARRCO reprint has also done very well. Which deck (or decks) of those you have been involved in producing is your favourite, and why? I really like The Guard for the classic type design. I guess each deck is special to me in its own way. Variety is the spice of life. What are some of the things you especially enjoy about producing playing cards? Working with all the involved parties to make it happen; artist, backers, supporters, printer, etc: For me the reward is the journey, not the destination. I think it is still a small niche market, and we will see further growth. It has been a huge impact, but it also greatly increased competition. But that has been a good thing, because it forces creators to do better work. I'm not sure about innovations, but I'm pretty certain it will continue to grow. What do your family and friends think of your love for playing cards? Do any of them share your interest, or are involved in your business? My wife handles accounting and my kids sometimes help. My office is right across the street from their school, so they are over a lot hanging out after school sometimes. My kids have a small collection of decks. What advice would you give someone just starting to collect playing cards today? I would say to enjoy it and just collect the cards you like - unless you really want them all, which some customers do seem to do. Always try to share the cards with others, because most people have no idea that these fully custom cards exist, or that there is a whole community of playing card enthusiasts. What do you consider to be important elements of a quality design, and what they should look for in a quality deck of playing cards? Design is a matter of taste, but I would say look for a USPCC deck for best quality and handling. My Circus Playing Cards deck is launching on Kickstarter (link). I have my first direct release planned soon, and a bunch of other decks in the pipe line. I'm always working on improving the website as well. What can you tell us about your Pip Box Club? Visit PipBoxClub.com and check it out. Right now we are on Month 6, with around 70 members, and I have received great feedback. We also have a Facebook group for members or for others who are just interested. You also have a loyalty program. What special benefits to do you offer regular customers? Basically every dollar you spend counts as a point which you can later redeem for free decks, discounts or other special offers. Customers love it. What is the best way to keep up with news about playing cards from PlayingCardDecks? Follow us on Facebook and Instagram, make sure you are signed up for our email newsletter, and check our site often! We live in a golden era in which many wonderful and creative decks of playing cards with unique designs have been produced. I love the fact that PlayingCardDecks has a tremendous variety of styles, colours, and designs of the great playing cards that are available today, and that's why I've personally made several orders from them now. Playing cards can be used for many different purposes, and whether you need cards for playing card games, card magic, card flourishing, or anything else, there's something here for everyone. Most of the decks carried by Playing Card Decks are printed by industry leaders like United States Playing Card Company, makers of the well-known Bicycle brand, with their standard air cushion finish, so the quality of these decks is consistently good. 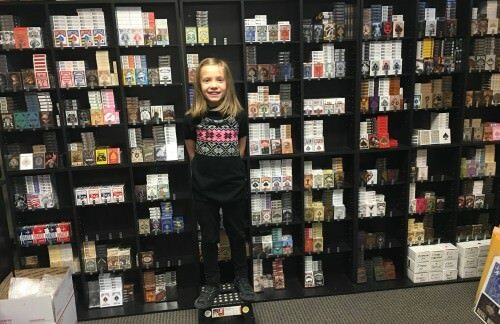 Not only have I been impressed with the large selection and range, which includes a large number of each deck in stock, but my experience with their customer service has also been positive. Whenever I had questions prior to making my final decision about which decks to get, email correspondence has always been prompt and pleasant. The website is professional, easy to navigate, and user-friendly, and I especially appreciate the fact that images of many of the cards are available, which ensures that you can see in advance what you're getting, so there are no unpleasant surprises. Shipping costs are a flat rate amount, or free depending on the order size, and a tracking number ensured that I could monitor things while in transit. My decks have always been well-packed, and typically arrived in a cardboard box with padded envelopes and styrofoam offering extra protection on the inside. From all of the above it is obvious that Will Roya has a real passion for playing cards, and is very active in making a positive contribution to the playing card industry on multiple fronts. He's well placed to contribute to the world of playing cards, given his extensive personal experience with magic and the retail industry, and it's terrific to see what he's been doing both in terms of producing playing cards and in selling them available to consumers like us. It's been a pleasure to do this interview and learn more about all this from the man himself - so thank you Will, and keep up the hard work!